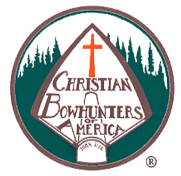 Christian Bowhunters of America (CBA) is recognized as an important outreach to the archery community. With programs directed to both adults and youth, we proclaim the Good News of the Gospel through the common denominator of the bow and arrow. CBA is a non-denominational ministry to the bowhunting world. It was incorporated in the state of Michigan on July 23, 1984 and the Founder is Rev. David L. Roose of Cadillac. He is also the former president of Michigan Bow Hunter, and a regular member of the Professional Bowhunters Society and Pope & Young. He also was the State Host Chairman of the 1995 Pope & Young Convention at Grand Traverse Lodge in Grand Traverse Bay, MI. Seeking to exalt and serve Jesus Christ by leading lost people to Him, and encouraging Christian growth! To promote the biblical truth that God is the Creator and Savior of the world. To bring an awareness of man's personal accountability to God. To challenge bow hunters to allow the Lordship of Christ to govern their individual lives. To provide helps and tools for sharing one's faith in Christ with others. To share the common joy and experience of bow hunting with other Christian bowhunters. To foster faith, fun and fellowship among bowhunters of America. 3. God The Father - We believe in God the Father, an infinite, personal spirit, perfect in holiness, wisdom, power and love. We believe He concerns Himself mercifully in the affairs of men, that He hears and answers prayer, and that He saves from sin and death all who come to Him through Jesus Christ. 9. Church Cooperation - We believe in the universal church, a living spiritual body of which Christ is the head and all regenerated persons are members. We believe in the local church and encourage every believer, as part of God’s family to regularly attend the fellowship of His church. 10. Christian Witness - We believe every believer has a scriptural mandate to share his life of faith in Christ. We believe the only Christ many will ever see is the Christ they see in us, thereby making our personal lives the most powerful influence for effective Christian witness. 12. Satan and Hell - We believe in the personality of Satan, the prince and power of this world and his ultimate defeat by Jesus Christ. We believe in a literal hell, a place prepared for Satan and his followers.